I moved to San Diego from Portland, Oregon in 1999, and the first place I lived was North Park, a block east of what was then happening on 30th: the Aztec Bowl, Empire Club, Scolari’s (the luminous original, rest in piece, sweet Freddy), the Roost, that mysterious, no-name “wolf” bar . . . We still had honest-to-Goth dance nights on this strip, my friends. This was a fine era. North Park was a genuine, low-rent/high-times, bohemian mini-mecca, shining in the final twilight of pre-internet-dominated popular culture. Being a modestly enterprising young music fiend, I decided the easiest way to meet others of similar mindset and ambition would be to place a flier, announcing myself as “drummer available.” The best place to do this, I guessed, would be the legendary Off the Record, then on Fifth, in Hillcrest. I walked all the way there from North Park, which took almost an hour, but seemed longer since I didn’t really know where I was going. But I knew when I found the place. 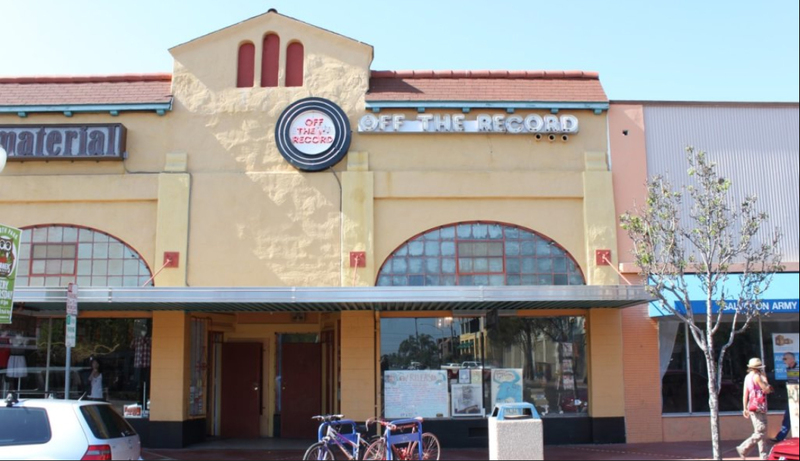 Off the Record was easily one of the busiest, most vibrant, sonically-charged record stores I had ever set foot in. Fifty or more people digging through the seemingly endless racks crammed with thousands upon thousands of records and CDs. At least a dozen employees, multiple registers, and that insane quantity of posters and displays, most of which were signed by the artists plugged. I had no idea where to start, but since I didn’t have so much as a dollar in cash on me I knew digging would be torturous. I asked a smiling, elfish-looking dude behind the counter if I could put a flier up, and he asked if I needed tape. By the time I got home there was a message on my machine from a certain Daniel Wise, who had apparently been in the store somewhere, working, and over the following decade the best-loved and most successful versions of Kill Me Tomorrow developed and flourished in our many weird ways. I’ve never loved working anywhere so much. I loved the store. I loved the people. I loved the music. The staff was small, but we were solid, and we always tried. We never caved to the current online equivalent of mafia window insurance, and we kept it real. We loved the store. I still love the store. I will always love the store. I knew we were always cutting it pretty close, in terms of cash flow, but I always believed we would somehow squeak by and remain among the last mom&pops still standing. I was devastated when I heard we were calling it. I still am. A part of me is gone with Off the Record, carted off with the last of the vinyl, locked behind that red and gold door. Thank you to everyone who came in. Thank you to everyone who has expressed condolences. This has been hellish, but as of yesterday it is all over, and I have high hopes for whatever comes next. Something always comes next. That said, if anyone has any work ideas for a bookish, musician-editor-writer-guy, hit me up with a private message. After nearly seven years, I am looking again. Be well, and keep feeling the beat, my friends. It is our pulse. Off The Record, North Park. R.I.P. Off The Record, North Park, interior.